The Disobedience Archive has been organized and exhibited in many different venues across the World since 2005. In the installation at the Lobby of the Media Lab Complex at MIT the Disobedience will expand to include cases of political and artistic action that have manifested in the geographic and historical terrain of Boston. In addition to this, new student works that critically interrogate concepts of Disobedience (produced in the research seminars, Art, Architecture, and Urbanism in Dialogue and Introduction to Networked Cultures and Participatory Media), will be exhibited in conversation with the pre-existing body of works that comprise the archive. 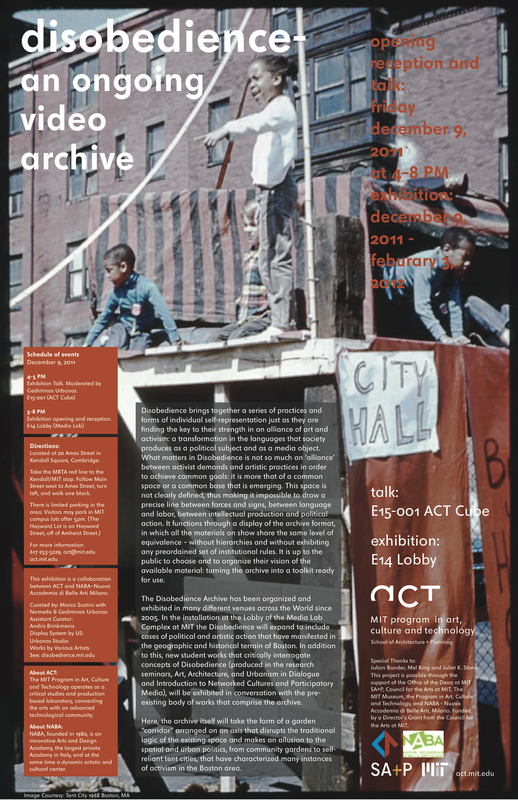 Here, the archive itself will take the form of a garden “corridor” arranged on an axis that disrupts the traditional logic of the existing space and makes an allusion to the spatial and urban politics, from community gardens to self-reliant tent cities, that have characterized many instances of activism in the Boston area. 16beaver group, Atelier d’Architecture Autogérée (AAA), Gianfranco Baruchello, Bernardette Corporation, Black Audio Film Collective, Copenhagen Free University, Critical Art Ensemble, Dodo Brothers (Andrea Ruggeri and Giancarlo Vitali Ambrogio), Etcètera, Marcelo Exposito, Harun Farocki and Andrei Ujica, Grupo de Arte Callejero (GAC), Alberto Grifi, Ashley Hunt, Kanal B, Margit Czencki/Park Fiction, Radio Alice, Oliver Ressler with Zanny Begg, Joanne Richardson, Eyal Sivan, Hito Steyerl, The Department of Space and Land Reclamation (with StreetRec., The Institute for Applied Autonomy, Las Agencias and AffectTech/BikeWriters), Mariette Schiltz and Bert Theis, Ultra Red, Nomeda & Gediminas Urbonas, James Wentzy, Dmitry Vilensky and Chto delat / What is to be done? Hans Guggenheim, Mel King, Juliet Stone, Richard Leacock, Sylvère Lotringer, MIT Museum, Paul Summit, Urbano platform, ACT UP and Food not Bombs amongst others. Disobedience Archive is produced in collaboration with ACT and NABA⎯Nuova Accademia di Belle Arti Milano. As well as with the assistance of Anna Caterina Bleuler (NABA, Milano, Italy), and Sung Woo Jang, Catherine McMahon, Slobodon Radoman (MIT, Cambridge, MA). This exhibition would not have been possible without the help of many dedicated individuals and with the generous support from our sponsors.